Handwashing is the single most important thing you can do to stay healthy! Unfortunately, much of what people end up washing their hands with is full of chemicals like synthetic fragrance, artificial color, paragons, disodium eta, SLS, and triclosan…all with potential harmful effects. Thankfully, EO provides safer options made in Marin County, California. Every EO product is plant and essential oil based, made with only pure and organic ingredients ­ Free of parabens, disodium EDTA, sodium lauryl, phthalates, petrochemicals, artificial or synthetic fragrances, chemical preservatives, silicone, propopylene glycol, detergent, mineral oil, triclosan, EDTA, aluminum, sulfate. Every product is Gluten-free and is non-GMO verified; no animal testing is ever done. EO Products is a leading manufacturer of natural and organic personal care products with over 150 products for bath, body, hands, feet, hair, home and pet and includes two brands, the EO iconic blue bottles and the new EveryOne by EO for the value-conscious consumer. EO is a family owned company that is passionate about creating quality products that contribute to the health and well being of both people and the planet. Founded in 1995, EO is the first non-GMO certified body-care company in the country, and was one of the first to be a certified organic manufacturer. EO crafts all their products using sustainable and small-batch manufacturing techniques at their 40,000 square foot facility in Marin County, Calif. 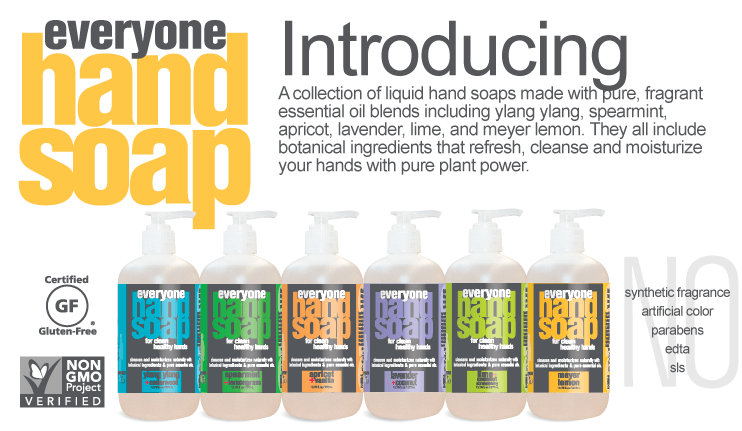 There are six flavors of the new Everyone hand soap, and we were sent all six to try! Until December 15, 2013, this new line of Everyone hand soap is being sold exclusively at Whole Foods and online affordably priced at $4.99. I think my favorite flavor is Apricot + Vanilla. I have always trusted EO products after my son had negative reactions to SLS in other “green” brands of soaps. I am pleased to see this line expand to broader markets and remain affordable, as well as safe!